Two ciders, two meads. Ok, two ciders, two melomels. Elderberry furthest to the right. Yummo. 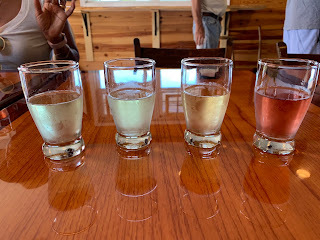 We had the great fortune of seeing this cidery and meadery sprout wings and soar this past weekend. Tucked away in a corner of Amissville, Virginia, this hidden gem is home to some of the finest ciders and meads I’ve tasted. That it’s located fifteen minutes from my home in the middle of nowhere tells me something the craft beer movement has known for years: many are thirsting for interesting drink. Build it and they will come. Cider- and mead-making are the younger siblings of the craft alcohol world. While wineries have been with us for decades and craft breweries at least a couple ten-year spans, these two are just lately exploding on the scene. Each is usually found on its own, the passion of a single producer with a love of the product. At Hinson Ford, the two come together, a joint vision of Dennis, mead-maker, and Dave, cider-maker. Neal and I had the pleasure of visiting Dave, Dennis, and Dennis’s wife, Mary, at Hinson Ford on a cool, rainy spring day earlier this year. Neal had followed their Facebook postings and scored an early invitation to what is now a tasting room. At the time, it housed equipment and a rolling bar amid the lovely rough-cut wall paneling and finished trim. We lucked out. The guys were happy to have visitors, and we were more than happy to sample everything they had on hand. It might have been eight, or ten, or a dozen meads and ciders; I forget. What was clear from the outset was the craft with which they were created. Last weekend saw Hinson Ford’s soft opening, and we attended with friends in tow. The soft end of a Virginia summer was upon the place as we arrived to find parking scarce and the tasting room crowded. Tables outside were filled with families enjoying the warm, less-humid weather that is our reward for enduring the moist heat of June, July, and August. And September. We lucked into an emptying table inside, where we held court for a couple of hours. The rolling bar sported a Square pay station, and a pressurized set of four taps sat next to it dispensing samples for the day. More examples of Hinson Ford’s work were available in bottles. We tasted everything. Each mead is fermented from a particular nectar of honey, all from the local area. The flavors are distinct and all are enjoyable. Critically for me, the meads at Hinson Ford aren’t overly sweet. Hinson Ford gets this aspect of mead-making right. They also produce melomels, mead flavored with fruit. Of particular note is the elderberry-flavored example. I returned for a full glass of this after my flight of samples and enjoyed every drop. This one is well worth your added attention. On tap during our visit were the elderberry and a strawberry melomel. Delicious. We returned to the bar for a full glass of Dark Skies Bochet, a rich, caramelized mead that drinks like a port. This one makes for a rich after-dinner drink. Each cider, likewise, is fermented from a particular type of apple. Crisper, dry fruit types are represented by crisp, dry ciders. I could spend the afternoon sipping these examples until I fall out of my chair. They’re authentic and delicious. On tap for our visit were Calville Blanc, Ciderhouse Blend and Brehon Blend, each distinctive. Calville, a dry cider appears golden and tastes crisp from start to finish, while Brehon, laid up in oak, bears a smoky wood flavor amid the fruit. Ciderhouse is a straight-up marriage of apple variety. I’m enthused not only that a craft alcohol destination has opened in my local area, but that Hinson Ford is a cut above. The tasting room is cozy, the owners run the place and they’re genuinely in love with the product they make. I’m not often this knocked out by a craft producer, having sampled my share of beer, cider, mead, and wine. I’m pleased to call these folks neighbors, and enjoyed my time at their lovely sampling and production digs deep in the heart of rural Virginia. The mead is magnificent, the cider sublime, and the people friendly and welcoming. Bring yourself and your family out for a visit.